We all store liquid bleach along with our other prepping supplies. Liquid bleach is a powerful disinfectant and sanitizer and it has been used to purify water as well. But did you know that there is something better? Something with an almost indefinite shelf life that is inexpensive and takes almost no room to store? That something is the chemical Calcium Hypochlorite more commonly known as Pool Shock. 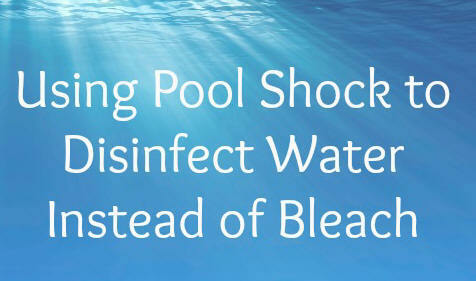 Now, don't be "shocked" by the thought of water purification via swimming pool chemicals. We'll show you how to do it safely. A 1-pound bag of calcium hypochlorite in granular form will treat up to 10,000 gallons of drinking water Calcium hypochlorite is one of the best chemical disinfectants for water, better than household bleach by far. It destroys a variety of disease causing organisms including bacteria, yeast, fungus, spores, and viruses. Before we start, you may be asking “why not use liquid bleach?”. There are a few problems with liquid bleach. It takes a lot of room to store bleach plus the usable shelf life is only six month to a year depending on storage conditions. The active ingredient in liquid bleach, sodium hypochlorite, is very sensitive to high heat and freezing, but under normal home storage conditions, it should still perform well for nine to twelve months. We have stored bleach for a longer period of time but you will see that the water in the bottle dehydrates leaving behind a salt mix. In addition to a limited shelf life, there is another problem. Many website have provided preppers a bleach/water mix that is based upon the old store bought bleach ratios. All liquid bleach is sold in a more concentrated level now, which could make it toxic. Add and dissolve one heaping teaspoon of high-test granular calcium hypochlorite (approximately ¼ ounce) for each two gallons of water. To make a stock of chlorine solution (do not drink this!) dissolve 1 heaping teaspoon (about one-quarter of an ounce) of high-test (73%) granular calcium hypochlorite for each two gallons (eight liters) of water. Another plus for using calcium hypochlorite to disinfect water for emergency use is that a little goes a very long way. A 1-pound bag of calcium hypochlorite in granular form typically costs only a few US dollars and can be obtained in any swimming pool supply section of your hardware store or online. This amount will treat up to 10,000 gallons of drinking water, which is enough for a family of four for some six or seven years at a gallon per day per person!